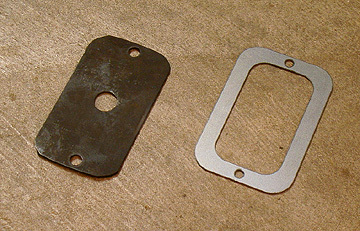 For Jeep Willys Wagons and Pick-Ups, I also carry some parts for the 2WD Borg Warner (Rancho) Overdrives. 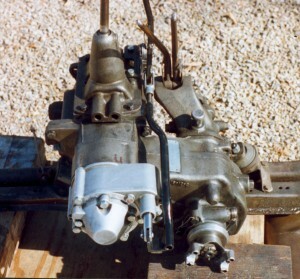 Also For vehicles with Borg-Warner (Rancho) equipped Spicer Dana-18 Transfer cases. All prices are subject to change before this website can be revised. Please contact me for the latest prices when ordering. Some images on this page are thumb-nailed for quicker viewing. Click on each image for full-size versions. This is a Brand new boot for use with the overdrive unit (Warn, Husky, Saturn, ATV) and a dual stick D-18. 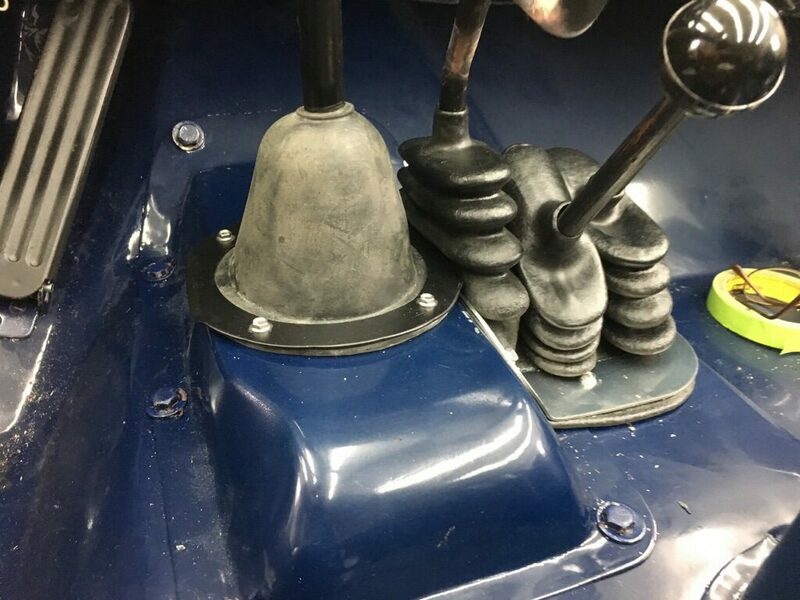 Includes 1 long lasting synthetic compound 3 shift handle boot, 1 stainless steel plate, 1 shift handle bracket, 1 shift link, 2 extended bolts, 2 bolt spacers, 1 shoulder bolt, 1 nylock nut, 1 shift knob, and 2 washers. The plate is flat and can be formed to fit the floor exactly as needed. Made in the USA out of high quality materials. 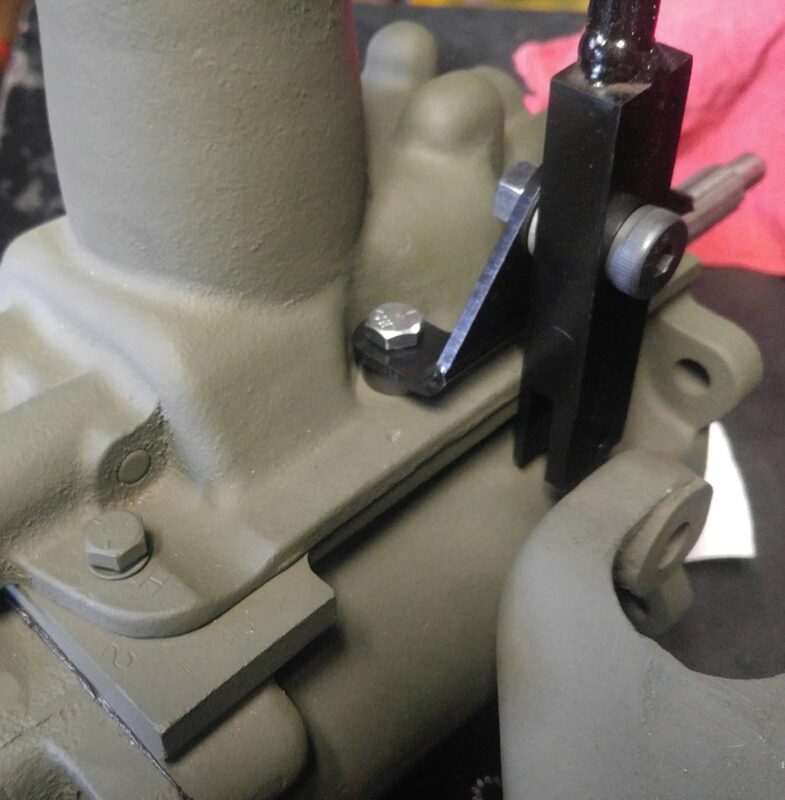 Instructional Guide to installing a PTO-Type Overdrive from a Dana-18 Transfer Case can be found here. 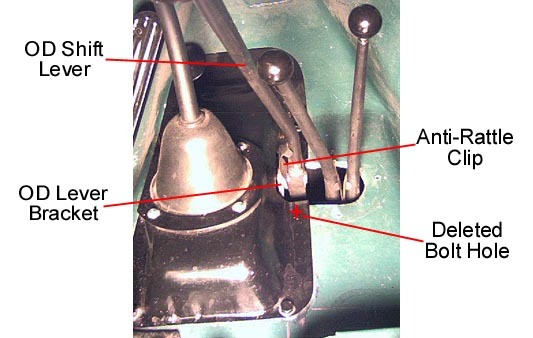 Instructions for removing a PTO-Type Overdrive from a Dana-18 Transfer Case can be found here. The CJ3B page has a great technical article on the benefits of an Overdrive with Engine RPMs and Speeds here. Shifter Kits and Boots are sold separately unless specified. 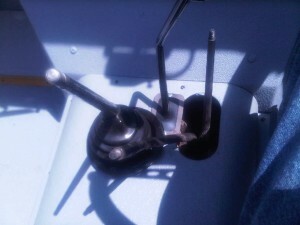 Overdrive Shifter Kits: Other applications also available. Call for details. 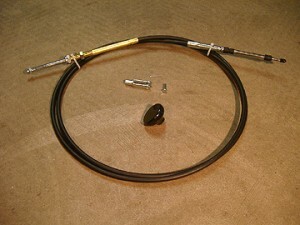 Depending on the application, minor trimming of the floor and/or transmission cover may be required. A piece of sheet rubber, at right, fits over the stock boot. 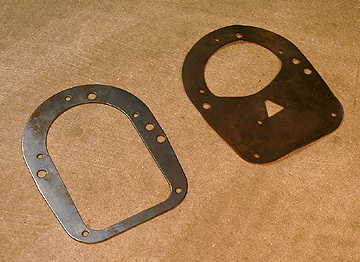 The retaining ring, at left, holds both boots against the floor. Depending on the application, the retaining ring may need to be bent by hand to match the contour of the transmission tunnel area. 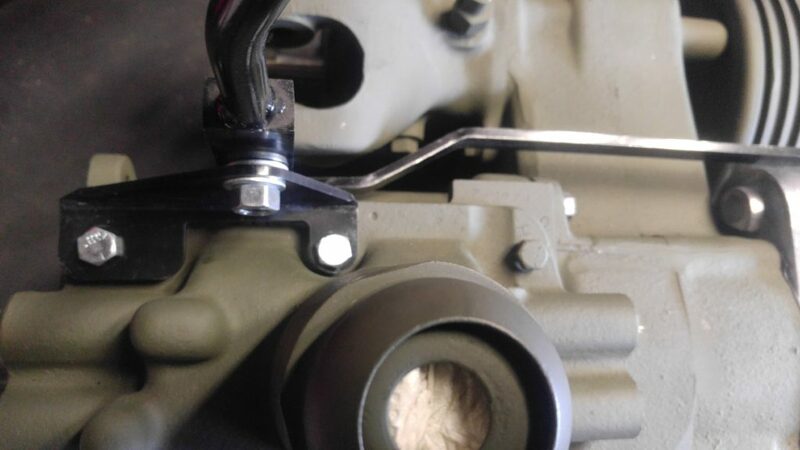 Designed for a single lever transfer case or other custom applications. 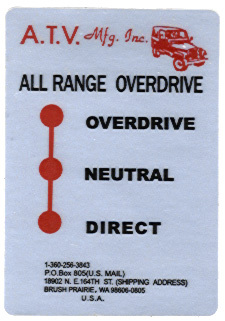 Overdrive Decal – Free with any purchase on this page. Previous overdrive buyers, please send a stamped, self-addressed envelope for your free decal. All others, the decals are available for $2.50 with free postage. 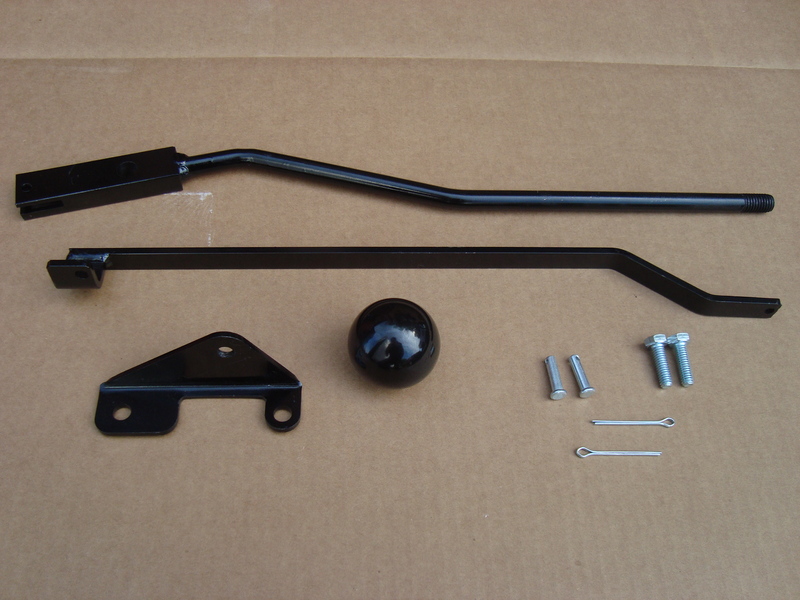 Scout floorboard with T-90 overdrive shift linkage with single boot & plate installed.